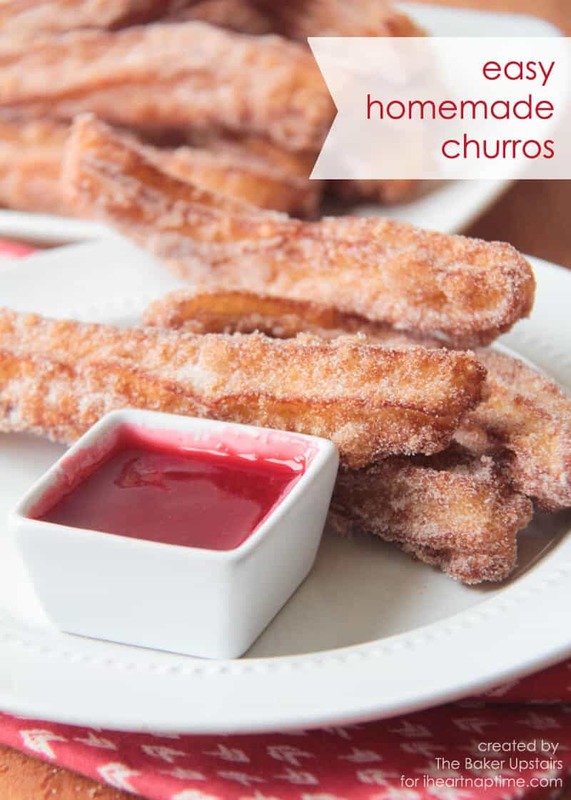 These easy homemade churros are to die for and are the perfect treat! 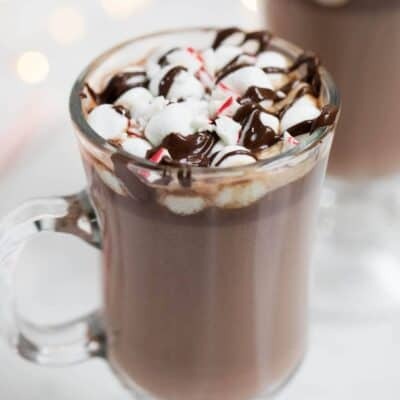 Sweet, simple and so fun to make! 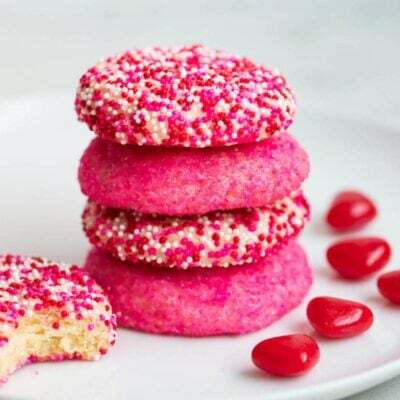 Pairs great with homemade raspberry sauce! By Alicia of The Baker Upstairs for I Heart Nap Time. Hello again, I Heart Nap Time readers! 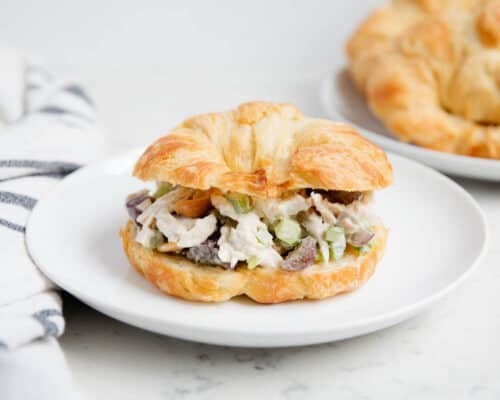 I’m so happy to be back sharing another delicious recipe with you today. Being on the I Heart Nap Time creative team has been amazing! There are so many talented women on the team and I love seeing all of their creations. 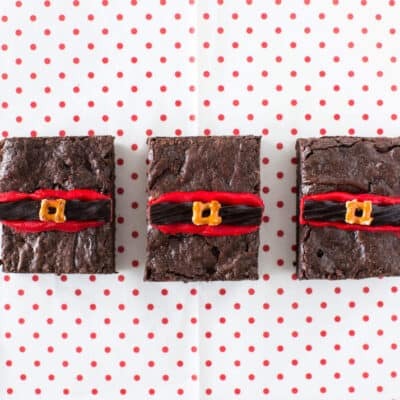 I have loved coming up with delicious treats to share with you, too! I’m especially excited about this easy churros recipe, because it’s one of my very favorite treats. 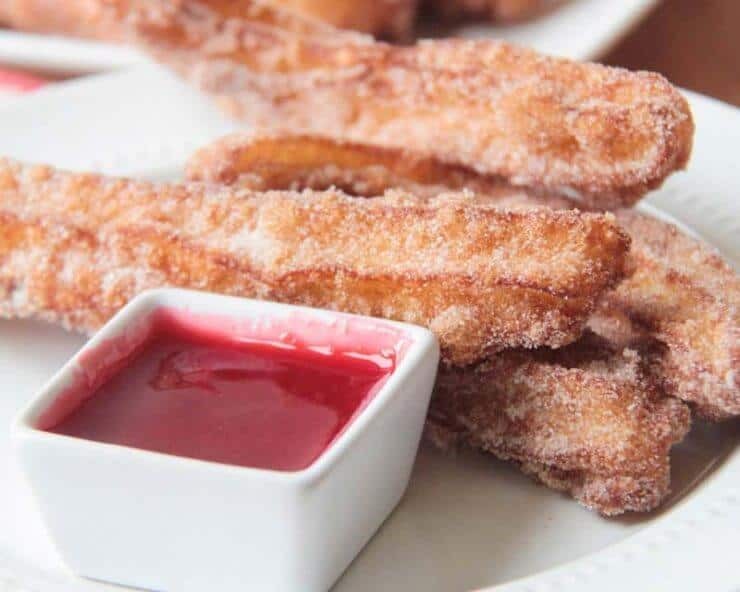 These easy homemade churros are beyond delicious! One thing I love about this recipe is that there aren’t too many churro ingredients. You start with a very simple pastry dough that comes together in just a few minutes. While you’re mixing the dough, heat your oil to 365 (I find a candy thermometer is really helpful for that step). When your dough is all mixed, scoop it into a pastry bag with a large open star tip and then you’re ready to make the homemade churros! Use a pastry bag and star tip to make this churros recipe. You could just use a plastic baggie with the corner snipped off. But I think the pastry bag + open star tip approach has a lot going for it. Not only does it make the homemade churros extra pretty with the classic churro shape, it also makes the whole process tidy and super easy! 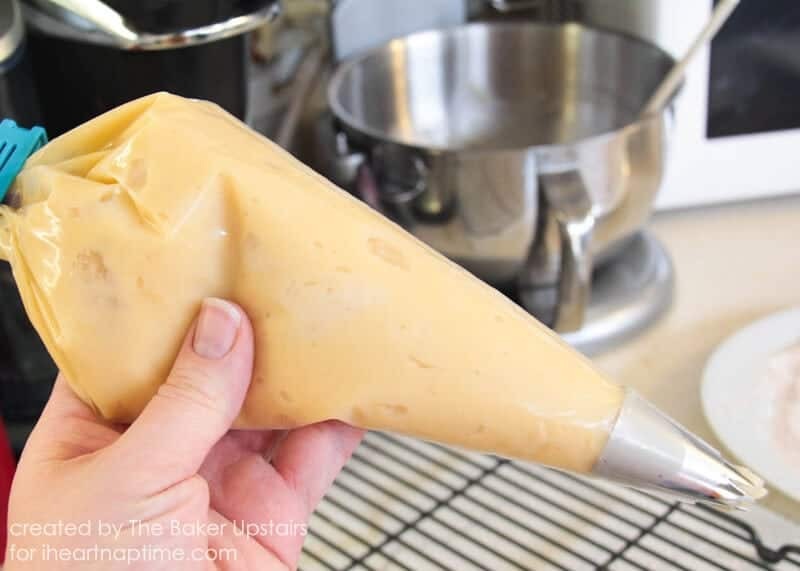 From there you just pipe 6 inch pieces of dough into the oil (I use scissors or a knife to get it to detach from the pastry bag) and let them cook for a minute or two on each side. Then let them drain on some paper towels. 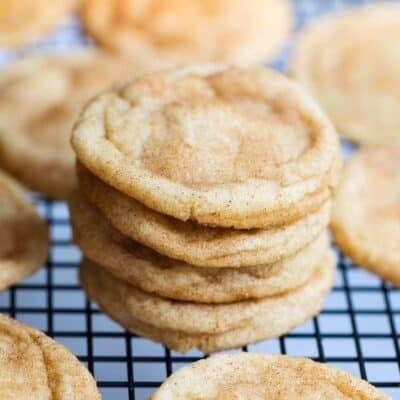 Once they’ve drained for a minute, roll them in cinnamon sugar and you’re done! I found my large open star tip at Walmart for about a dollar, but you could also find one at Joann or Michael’s or any craft store. 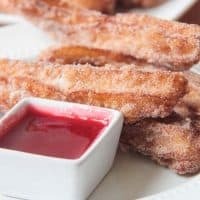 My favorite way to serve these easy homemade churros is with some raspberry sauce that I whip up on the side for dipping. 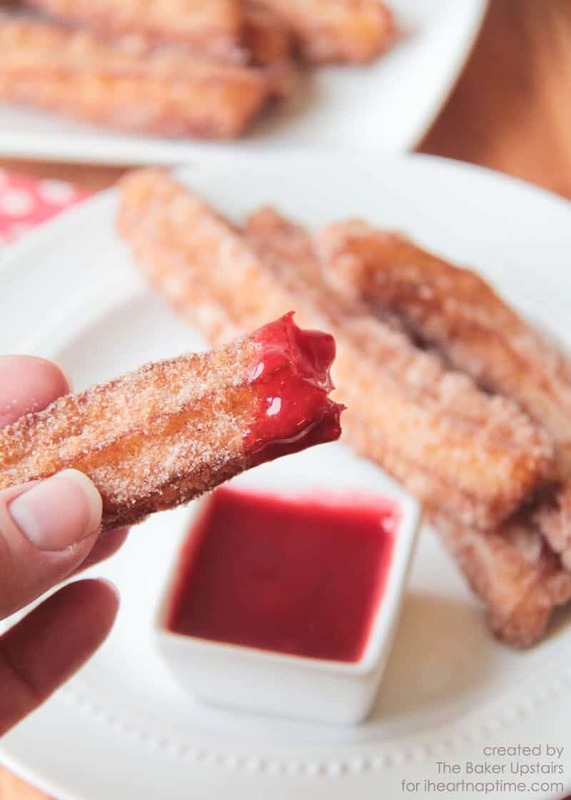 The tart raspberry sauce is a delicious contrast with the sweet, simple churros. The sauce is also quick and easy and cooks for just a few minutes on the stove. 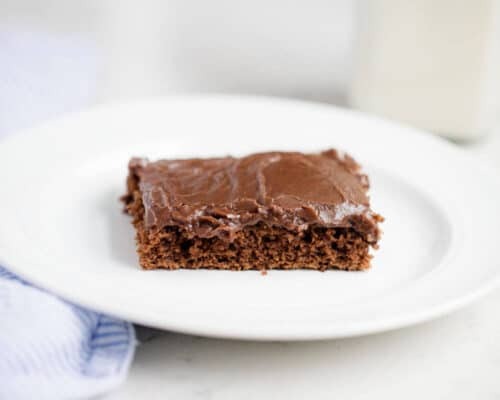 This is one of my favorite desserts because it’s so easy and yet is so delicious and fun! To make the churros, add the water, butter, and salt to a medium saucepan and heat over medium high heat, stirring occasionally, until the butter is melted. Remove from heat. Add the flour all at once and stir to form a dough. Add the eggs one at a time, stirring well after each addition, until the dough is smooth and satiny. Scoop the mixture into a piping bag fitted with a large open star tip. Heat the oil in a pot over medium heat until it reaches 365 degrees. While you’re waiting for the oil to heat, prepare an area to drain the churros. I usually use a cooling rack lined with paper towels. Mix together the sugar and cinnamon in a shallow dish and set aside. Carefully pipe six inch lengths of dough into the oil, being careful not to crowd the pot. Let cook 2-3 minutes on each side, or until golden brown. Remove and let drain for 1-2 minutes, then roll in the cinnamon sugar mixture. To make the raspberry sauce, whisk together the corn starch, sugar, and water in a medium saucepan. Add the raspberries and stir to combine. Heat over medium heat, stirring frequently, until the mixture reaches a boil. Let boil one minute, then remove from heat. Strain through a fine mesh strainer (if desired) to remove the seeds. Churros are amazing when they’re done right… Unfortunately, they’re easy to mess up. Seems like quite a few people have had difficulty with this recipe, and I’m not surprised based on the ingredients. I’ve never seen a churro recipe with eggs and butter in the batter. Best part of Mexican food is defiantly the churros for dessert!